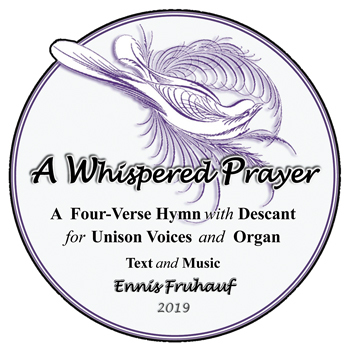 A Whispered Prayer, for unison voices with organ accompaniment, is the third of a trio of complimentary hymn anthems to be offered by Fruhauf Music Publications in the course of 2018-19. Available in May, the hymn text is multi-seasonal. The setting provides three unison verses and a brief transition, followed by a unison fourth verse featuring a free accompaniment and descant. A visit to FMP’s home page bulletin board at www.frumuspub.net will provide a link to the letter-sized PDF booklet file’s download page, along with access to the other two anthems and an organ postlude, Carillon-Toccata on St. Anne, all being featured this year.